When starting a business, it seems so simple: You provide your customers with goods and/or services; in exchange, they pay you. And it would be just that simple, if you only accepted cash tender. If you’d like to make your business grow, it becomes essential for you to start accepting other forms of payment — namely, credit cards — especially if you want to make your customers’ payment experience convenient. That’s where things can become complicated: If you don’t know what to look for when choosing a credit card processing service, you may end up with far more of a hassle than you bargained for. Monthly Minimum Fee: This is a fee that comes into play if you don’t process credit cards in a given month. Many processors charge $25 or higher if you’re not processing, but you should be able to have this minimum waived just by asking. Gateway Monthly Fee (eCommerce clients only): On the lower end, you might expect to pay $5 a month, and on the higher end, $15. Interchange Fee: This is a two-part fee that you’ll pay per transaction — it’s known as Interchange which is the fee structure set by Visa/Mastercard. Do not accept a merchant account with anything but an Interchange pass-through pricing model, as all other models hide the true cost of accepting credit cards. Interchange will cost anywhere between 0.05% and 2.8 % multiplied against the amount charged, and then for every transaction there will be an additional $.05-$.22 as well. Interchange depends on the card type that your customers use and has a range of fees loosely tied to the level of risk associated with each card. 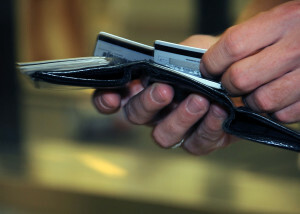 For instance a debit card tied to your checking account has one of the lowest Interchange fees at .05% + $.22 per transaction, while a corporate credit card often issued to everyone in a large corporation (from new employees to executives) will run upwards of 2.4-2.8% + $.10 per transaction. Processor Fee: These are the fees above Interchange, and are controlled by the processor or agent you opt to work with. Typical processor fees are .15-.30% multiplied against the transaction amount plus an additional $.05-$.25 per transaction. If an agent, or even your bank, are offering rates above these levels, go elsewhere…and fast! By doing your homework coupled with a little negotiating, you can get these fee pushed down even further. Considering these fees, it’s evident the most important of the four to research is the transaction fee, which can end up taking a large chunk of your profits, if you’re not careful. For this reason, a number of small businesses that settle for high fees may end up losing money on their sales. A number of business owners get into a contract without realiZING there are limits on transactions sizes and frequency. And why would they? Credit card processing companies stand to make a lot of money when a business violates its contract, so they might gloss over these points when making a deal. Unfortunately, it’s sometimes not enough to just ask a representative about your limits: Make sure you find that amount specified in your contract, and make sure it works with your business. The last thing you want is for your credit card processing contract to punish you for your growing success. A very unattractive feature of many credit card processing service agreements is that the contract is subject to be changed at any time by the service company — meaning, everything you’ve worked so hard to research can be changed in a snap. Likely, you’ll be able to call up your representative and refute these changes. It’s imperative that you check your mail for notifications, so that you can act before months go by, and you end up paying steep transaction fees you weren’t aware you agreed to. If you’re just starting out, it’s a good idea not to get locked into a fixed-term contract, so that you can get out of it if you need to. When start-up fees begin to add up for your company, it may sound more appealing to rent a terminal than to purchase one — you’ll be covered if your rental breaks, and you can just hand it back if you switch services. However, if you expect to be in business for more than a few months, a rental terminal will end up costing you thousands of dollars, at around $50-$100 a month, instead of the $200 to $500 one-time purchase. Plus, you may even be required to buy ongoing insurance for the rental terminal, meaning you’ll end up paying far more than its actual cost in only a matter of months. If you’re looking for a credit card processing company that wants to be an accessory to your business, rather than a drain on it, but you don’t know where to turn, talk to AdvoCharge. We’re connected with almost all national processors, and we will advocate for your company and pair you with a service that won’t charge you unfair or hidden fees. Plus, we can save you 70 percent to 90 percent over the fees paid to most processors. It’s predicted that 75 percent of transactions will be made with credit cards by 2017, so get going with a good processing service early in the game.